About The 5 Subject Notebook Spiral with 180 Sheets of Wide Ruled Paper 4-Pack. Being in school or anywhere where you need to write a lot of note's or daily reports but you want to have everything in one place. The Emraw 5 Subject Notebook Spiral with 180 Sheets Paper where you can write in everything in a nice order without losing anything. The pages are securely bound to a smooth spine ensuring a long-lasting value. This Spiral Notebook is lightweight and ready for anything; toss it into a backpack or bag - so easy just pick up one for each class or project. They have nice lines plus a header space above on every page so you can get a lot information on every page, and that makes it especially good for students. The Spiral Notebook will easily insert into any binder with the 3 punched holes so it will be neater. There are dividers to separate the 5 subjects one from the other that will help you keep everything organized very well. Neat Sheet perforated pages are easy to tear out and leave clean edges without any residues. Kids can personalize the cover with a collage of pictures, stickers, photos to tell about themselves/project's. ✓ The Emraw 5 Subject Notebook 180 Sheets is ready for any assignment and is used by students for formal and creative writings and journaling etc. and is perfect for home, office and school use. ✓ SPECS: The length size is 10.5" and the width is 8" and its suitable for all types of pens and pencils and fits in the purse or carry bag nicely without being too heavy. ✓ QUALITY: The wide-ruled sheets gives you plenty of space for writing and they're Spiral binded so your work stays in place - The cover is sturdy and protects the sheets and holds up over the course of the school year and beyond. 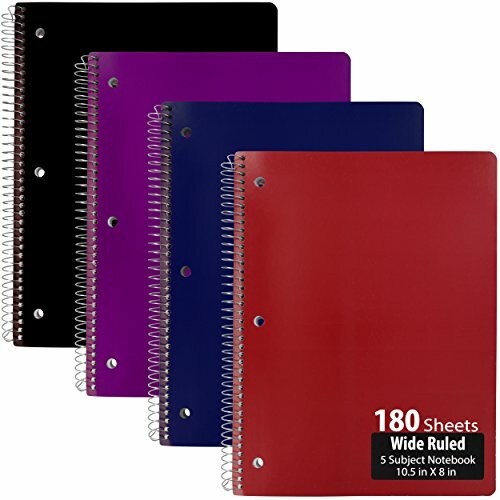 ✓ DESIGN: Durable colored cover with secure spiral binding keeps the 180 sheets of wide ruled white paper clean, dry and protected, and the 3 punched holes in the spiral notebook fits easily into a binder and sheets tear out easily without leaving any residues. ✓ USES: Useful to Record your thoughts the moment they occur, wherever you are. You can cross them out, forget them and find them again - Great for writing/sketching in class, home, office on the train or for Science/Social study works, making a list or just to doodle.